New Year traditions abound with the happiest circus in town! 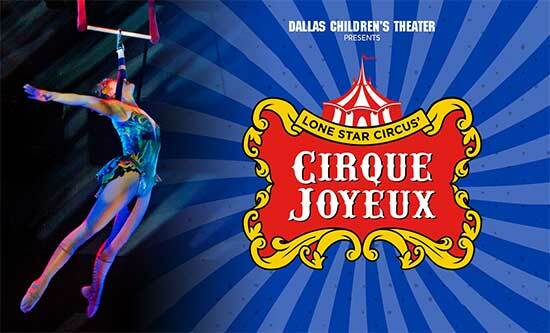 Ring in 2018 with thrilling daredevils, electrifying jugglers, mesmerizing acrobats, hilarious clowns, and endearing four-legged performers with Dallas’ very own Lone Star Circus. In their new production, Cirque Joyeux, families will get up close and personal with circus stars from around the world. Make plans now to swing from the rafters December 28, 2017 – January 1, 2018 at the Rosewood Center for Family Arts. New acts this year include legendary Ringmaster Johnathan Lee Iverson, who was featured on Barbara Walters’ list of 10 Most Fascinating People for his work with Ringling Bros. and Barnum & Bailey. Geddy Pavlovich will showcase his mind-boggling rola-bola equilibriums, and guests will witness the elegant hand-balancing contortions of Irina Naumenko, a featured artist of Cirque du Soleil’s Varekai. Rokardy will display his captivating chair balancing, recently seen on NBC’s America’s Got Talent and in Cirque du Soleil’s La Nouba. Another feature will be the striking aerial choreography of Kelli Ramazini. The amazing Campa Family will combine music and humor in a way North Texas has never seen before. Asaf Mor is back with an all-new electrifying hula-hoop act and Joseph Gibby returns with magnificent acrobatic balancing. The show will also feature the joyous, colorful canine acts of The Pompeyo Family and their Amazing Rescue Dogs bring the joyous, colorful canine acts that captivated audiences on NBC’s America’s Got Talent. Réjean St. Jules presents his mesmerizing, award-winning juggling, and Angelo Rodriguez brings his kinetic aerial prowess. Circus 2-Wins will demonstrate their delightful, double aerial hoop. And not to be forgotten are the Queen and King of laughter, Slappy and Monday. With only ten performances slated for CIRQUE JOYEUX, patrons should buy tickets early to ensure they’ll experience the jaw-dropping feats from world-class performers. Tickets range from $22-$48 and can be purchased online at dct.org. Enjoyed by all ages. General tickets are available online at dct.org or call the Box Office for details, 214-740-0051.